The first Disneyland in Anaheim, California opened its gates almost 60 years ago, on July 17, 1955. 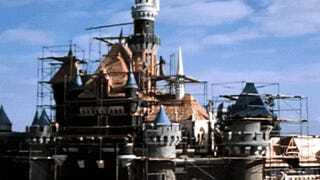 As part of an upcoming anniversary celebration Disney released raw, time-lapsed footage of the construction that happened under the direct supervision of Walt Disney himself. You can get a glimpse of the process—captured by some really high-end cameras of that era, scattered throughout the site—of how the Main Street, Tomorrowland or Sleeping Beauty's Castle were built between 1954 and 1955. There's more here. Different parts of the archive footage with commentary.